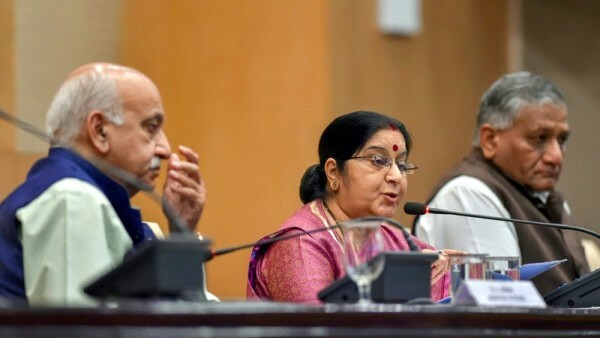 Time to worry Mr Akbar (left): The MEA team with Sushma Swaraj and VK Singh. He was the Prince of new journalism, a terror in the newsroom and a stalker of young vulnerable trainees. The once legendary MJ Akbar known to have whipped the mighty Statesman out of Calcutta with the vibrant newsy Telegraph must have never imagined that his past would catch up someday. It had to because the mighty predator would hunt with precision. And now that the once-journalist-turned-politician sits in the high office of a minister in the sanskari Modi government, one hopes that he will be made to pay for all his sins. The #MeToo movement that has caused a storm in the film industry and singed newsrooms reached the Modi government with former editor and union minister M.J. Akbar being named for sexual harassment by two journalists in the social media. A day after journalist Priya Ramani levelled allegations against Akbar, who is a junior External Affairs Minister, another of his former colleagues Prerna Singh Bindra came up with charges of sexual harassment. The story by an unnamed woman journalist did not name Akbar but referred to him as a boss of a new newspaper published simultaneously from Bombay, Delhi and London (The Asian Age). “But yes, I was definitely never a favourite post that incident,” it added. Bindra had on Sunday made allegations against Akbar but did not name him. “He was this brilliant, flamboyant editor who dabbled in politics, who called me-my 1st job-to his hotel room to ‘discuss work’, after i put the edition to bed-read midnight, and made life at work hell when I refused, couldn’t speak up due to various compulsions, but yes #MeTooIndia,” she had said. However, on Tuesday she named him and made a series of tweets. “But the great have feet of clay. I have narrated the story in my earlier tweets. I enjoyed our conversations-he was witty, intelligent, but this did not mean i was available. After I refused to go to the hotel at night- post putting paper to bed- things got nasty. “He made lewd comments, once when we had a meeting with the entire features team. One of the girls told me later he had asked them to meet him in the hotel too. I was alone in the city, vulnerable, fighting battles on personal fronts. I kept quiet,” she said. “Once, I recall going for a story-in Mumbai Mantralaya, and the officer tried to grab me: And I thought whom do I complain to: my editor is made of same stuff. And I walked away from AA. dug up dirt-on corruption-on the officer, but the next newspaper refused to publish it,” she added. BJP leaders spoke in different voices on the #MeToo campaign with women and Child Development Minister Maneka Gandhi supporting it. Answering a question about allegations against a politician in the campaign, she said there should be an investigation. “Those who are in positions of power always use it, whether it is film, media or industry. Whenever women make such allegations, we should take them very seriously,” she said. However, BJP MP Udit Raj questioned why women were coming out with their stories ten years after the alleged incidents and dubbed it as the “beginning of wrong practice”. “It must also be considered that it can ruin the public image of accused person,” the Bharatiya Janata Party (MP) from northwest Delhi said in a tweet. India’s #MeToo movement is finally here; is it going to singe media, Bollywood?